Today’s guest became an international best-selling author with her debut thriller, The Faithful. On another note, Shoshona’s author page on Facebook linked to an AMAZING article on teaching your kids about “tricky people” — ie: the kind of adult who is not safe. Parents, read this. It’s an easy, not-scary read because the kids did everything right, and it introduces a potentially life-saving concept to parents and kids alike. Back to books! 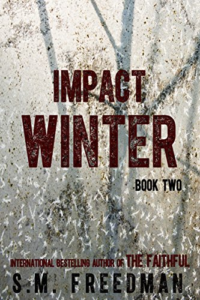 Impact Winter, the sequel to The Faithful, comes out on July 1st. Shoshona is running a Goodreads Giveaway, so go check that out before July 1st. Or you can preorder! One last thing: we talk about Shoshona’s career as a private investigator and how no one suspected a woman in her twenties of being a PI. It reminded me of Steph Cha’s Juniper Song series, where the same is true for her PI. Truth mirrors fiction! As always, if you’d rather read than listen, here’s the transcript. Enjoy! Laura Brennan: My guest today is international best-selling writer S. M. Freedman. 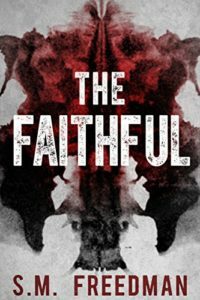 Her debut novel, The Faithful, is a complex, haunting thriller, and it’s soon to be followed up by the sequel, Impact Winter, which launches July 1st. Shoshona, thank you for joining me. S.M. Freedman: Thank you so much. LB: So before we talk about your books and your writing, I have a few questions about your background. You actually worked as a private investigator? SF: Yes! Yes I did. I worked in the private investigator. I started out — actually, I went to a theater school in New York, and I came home with the knowledge that I really didn’t want to pursue that as a career. So the only thing I could think of that I was interested in becoming was a private investigator, and I thankfully had a little bit of a hook up in that industry. So I was able to get in and be trained by them. And I spent a little under a decade doing that job. LB: Oh, my gosh! That’s the dream. LB: I can see that. SF: As a young girl, I loved it. Nobody ever suspected me of anything, I looked completely innocent. LB: Steph Cha, who I also interviewed, she has a PI series and her PI is a young, in her 20s, Korean American woman. LB: And that’s one of her things, no one ever suspects the young Korean American woman of being a detective. SF: It’s true. It’s true. It’s funny, I’m actually writing a detective novel myself right now with a private eye who lives in Palm Springs. And I’m kind of bringing together a few of my different little elements of my background into one person. And he’s Jewish, raised as a fairly traditional Jew, but has kind of fallen by the wayside on that. And he’s a private investigator because he’s a failed cop. And he’s also an Elvis impersonator on the side. LB: And you, of course, were an Elvis impersonator? SF: No, that’s the only thing I can say I really didn’t do. Although when I was a teenager I absolutely loved and adored Elvis and everything that had to do with him, his music, everything. So I, I went through an Elvis phase as a teen. So that kind of, I brought that in as well. LB: So how did you get started writing? SF: I began writing, I think, when I was about 12 years old. I really decided that I loved it. I had this — I was a terrible, terrible student and I had this one amazing teacher in grade 7 who really saw my potential in a way that no other teacher seemed to have seen it. And I started writing really horrid poetry and embarrassing little, you know, puppy love stories and stuff. But he managed to somehow, I don’t know, plug his nose and pretend they were fantastic and really encouraged me. And I think from that moment I said to myself, I want to be a writer. And then I kind of took a very circuitous route to get there. I did other things. I went into acting, I went into being a PI, I owned a business for about eight years and then I kind of fell back into it as that’s the thing I always wanted to be, that’s who I really am. LB: So I read that your inspiration for The Faithful began with a meteorite. SF: Yes. It did. There was a meteorite that exploded above Russia in February of, I believe it was 2013. It just kind of sparked my interest in who’s watching the skies and who is actually out there trying to make sure that we don’t get stuck by a meteorite. And I started researching it and really became my main character Ryanne, who’s a meteorite hunter and she works at a, in a little trailer on the White Sands Missile Range in New Mexico. And there actually is that job there. They have the telescopes there. I changed the area where it is just a little bit, but it’s on the White Sands Missile Range. So all of that that went into the novel is actually real, or as real as I could get it. LB: From that beginning, you go in a lot of really interesting directions with it. SF: Yeah, I do. I think that, I don’t know if it was Stephen King or some author at some point said something that really resonated with me and I’m going to completely butcher it, but it basically had something to do with, you take two different things and put them together and go ‘What if?’ And that’s kind of what I did. I had this whole meteorite thing that I was really fascinated in, this whole fear of something coming out of the sky and basically destroying the earth. And then I had this other fear, which is losing a child. And I think most parents have that fear, in one way or another, you know, losing a child. And so I had these kidnapped children and I kind of put them together and I said what if there’s a cult, or something that became much bigger than even a cult, that’s kidnapping these psychic children. And it just kind of went from there. LB: Well, you’ve been compared to Stephen King. SF: Apparently, I have! It’s the hugest complement I could ever imagine getting, honestly. I don’t think I do it justice, but I’ll take it. LB: The book has done really, extremely well. It was chosen by Suspense Magazine as one of the best books of 2015, and it’s an international bestseller, which I want to talk about a little bit more, but what you think it is the people really connect with? What speaks to them? SF: You know, I don’t know. When I set out to write it, I was really just writing for myself. It was the first novel I had written since I was 12. And, trust me, my novel when I was 12 was horrid and nobody would want to read it. So I started writing for myself and I really didn’t know what I was doing. And I kind of just limped my way through it and trial and errored it. But I think that, people have said that they really love the characters and that they related to them. And even though they were odd and, you know, they have psychic abilities, which not everybody can of course relate to, but they were somehow still relatable. They were real people with real problems, and that seems to be the general consensus with people who actually enjoyed the book. LB: Impact Winter is the second, it’s a sequel, it’s the follow-up. SF: Yes. It’s the dark middle child, I think, because there’s, I believe, going to be a third one. LB: Well, actually that’s perfect because it leads to my question: did you always envision it as a bigger story than one book could hold? SF: I don’t know if I did right away. Because I think when I was writing The Faithful, I was just focused on surviving. It was really, it’s a big book and it was way bigger when it first started. When I first did the end of the first draft, it was huge and way too wordy. I think I was just focused on surviving, but I knew that the story that I’d told, there was so much more to go. And there was no way I could fit it all in The Faithful, so fairly early on, or somewhere in the middle of my first draft, I started to suspect that this was possibly a trilogy. LB: The Faithful with an international bestseller. LB: And I understand all the English-language countries: Australia and England, the UK, Canada and America, the United States… Italy? SF: Yeah. Yeah, I have no idea. LB: Was it translated into Italian? Or was it a bestseller in English in Italy? SF: It was a bestseller in English in Italy. No, it’s supposed to be translated into several other languages but that seems to take quite a bit of time. So the English version is the one that went bestseller in Italy. It was very brief, it didn’t last very long, but apparently some people in Italy liked it. I’m not really sure how that happened. It was a bit of a surprise, and the only thing that I can think of, maybe, is that the I Fidele, which is the cult if you want to call them that, that is kidnapping these children, they’re originally from Italy. SF: So I thought, well that’s kind of cool. Maybe was that link somehow. I don’t know. SF: No, it’s true. But that seems to be, that’s my only guess, is that there’s that. Because I don’t know anybody who lives in Italy who could have spread the word. LB: Now, you also, you talked about how you studied acting. Do you think your background in acting helps you with your characters? SF: I think it does. I don’t even know if it’s so much the training I did in acting, but just the ability to act at any level because as an actor you really have to delve very deep into your character and who that person is. They really have to become real to you. And even looking at the script, the script is just hints of what you’re going to do with that character. And a good actor takes the hints and they create a whole world surrounding that character and they become that person and so the make decisions about everything, from what that character likes to how they dress to everything. Their whole background their whole history from childhood on, and even if they only have 20 lines throughout the course of a script, they bring that background to it to create the reality. So I think that in a sense, that’s kind of how I used that. And also maybe a little bit of an understanding of the dramatic. LB: What did you, what did you enjoy most about writing it? SF: You know, I really enjoyed, I think I really enjoyed getting to know the characters. I enjoyed those moments when something that I wasn’t sure of, wasn’t sure where I was going, when I had that ‘Aha!’ moment and realized, okay, this is where it’s going. And a lot of times especially in Impact Winter, it was not at all where I thought. And letting the story lead me was kind of fun, once I managed to let go a little bit. LB: So then what was the hardest part? SF: The hardest part is the fear. The fear of not getting to the end of the first draft. I think there a lot of authors who really plot out their whole story ahead of time. And I just, I don’t know, I hope I can grow up enough to do that someday. But I can’t seem to get it. Like, I, I will figure out a general idea, and I usually have a general idea of where it’s going to end, but I don’t know how I’m getting there. So there’s always this fear that I’m to get stuck and never find the end. LB: That’s interesting because the end of — I don’t want to give any spoilers — but I felt that the end of The Faithful very much was fulfilling of what you set up at the very beginning. SF: Absolutely. And I did know that that was what was going to happen at the end. I always had that goal in mind. It’s just I didn’t know how I was getting there. And I was definitely worried I was going to get lost along the way. But editing helps too. LB: Editing is great. Editing is great. 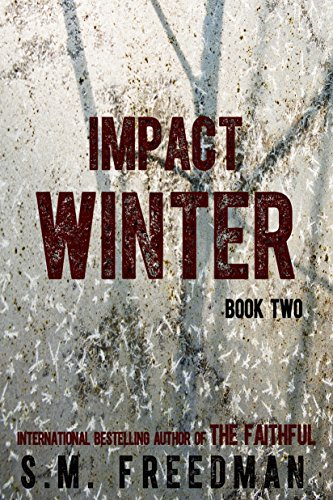 So Impact Winter launches on the first of July. SF: Yes it does. Canada Day. LB: Oh, fabulous! When can we expect the third? SF: Well, I have to write it first. So it’s actually on my back burner. I’m, as I mentioned earlier, I’m writing a detective mystery right now. This detective just wouldn’t leave me alone so I feel like I need to get his story down first and then I’m going back to the third installment. But I’m hoping that I will get it written this year and then it’ll get into the editing process and the publishing process. So probably a couple of years. LB: And then into our hot little hands. SF: And then into your hot little hands, yes. LB: Fantastic. What are some writers that you’d like to give a shout out to? Any friends or anybody you’re reading right now? SF: Well, I have an amazing group of writers that I’m part of a group, we formed a group together a few years ago. We met through the Amazon Breakthrough Novel Award. Which was something that they used to do, and it was actually as it turned out the very last year that they were doing it, which was 2014. So we met while we were preparing for that. And we eventually formed the World Wise Writers. And they are just an amazing group of women and authors and they are — one of them lives in the UK and the other three live in the United States, one’s in Savannah, one’s in Seattle, and one’s in Idaho. And I don’t do anything without their help and approval at this point. I think they could say the same for me. We pass everything along to each other from are very rough first drafts to blog posts sometimes that we’re not sure of, everything gets passed along. LB: That’s fantastic to have a support group like that. SF: It really is. I don’t know what I’d do without them on my side. I think there are so many, I think writing can be really a lonely profession because you sit in your home and you do it all by yourself, and if you don’t have those connections outside of your home with people who actually want to talk about writing all the time, you get pretty lonely. LB: Shoshona, it’s been terrific talking to you. Thank you so much for joining me today. SF: Thank you so much I really appreciate it. Don’t Miss a Single Murder! Copyright © 2019 Destination Mystery All Rights Reserved.